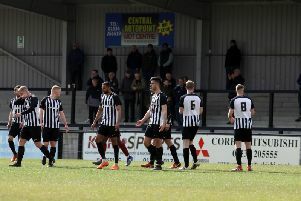 Corby Town moved to within two points of leaders Peterborough Sports after they thrashed Kempston Rovers 5-1 at Steel Park. A three-horse race is developing at the top of the Evo-Stik League South Division One Central and, with fellow high-flyers Bromsgrove Sporting beating Sports 4-3 in the big game of the day, the Steelmen took full advantage to also close the gap with a comprehensive success. Captain Gary Mulligan set the ball rolling when he headed home a Sam Warburton free-kick at the far post eight minutes before half-time. The Steelmen were stung by an equaliser on 64 minutes when Nathan Tshikuna curled the ball past Dan George. But the response was immediate as Connor Kennedy headed home a corner to make it 2-1 and Corby went on to finish the job off in the final 10 minutes. Sam Grouse had an immediate impact after coming off the bench as he slammed home after being picked out by Jordon Crawford. Crawford claimed the fourth after his corner looked to go in direct, although Elliot Sandy was on hand to bundle it home. But Sandy did grab the fifth in stoppage-time when Ben Bradshaw closed down the goalkeeper and knocked the ball into the path of the frontman who finished it off. The Steelmen are back in action next weekend when they head to Didcot Town. AFC Rushden & Diamonds maintained their position in the play-off places in the Evo-Stik League South Premier Division Central with a 0-0 draw at Alvechurch. Diamonds were indebted to goalkeeper Ben Heath for making a couple of fine saves in an end-to-end opening half. More chances came Diamonds’ way in the second period with John Dean heading straight at the home goalkeeper while Ben Farrell was just off target with a dipping effort. It continued to be end-to-end and Farrell was denied by the Alvechurch goalkeeper while Diamonds had a couple of late penalty shouts - one for a foul on Alex Collard and the other for handball - waved away. In the end, both teams had to settle for a point and Diamonds now face a two-week break before they return to action. Their scheduled home clash with Stratford Town next weekend has been changed to Tuesday, January 8 with Stratford in Buildbase FA Trophy action next Saturday. It means Diamonds’ next game will be on December 22 when they travel to Redditch United.